This is a question that is asked over and over again. If a lead is not responding, how much follow-up is too much? Are you following up enough? For unresponsive leads, a follow-up process should be 60 days long and include approximately 11 steps (a combination of phone calls, emails and video emails). 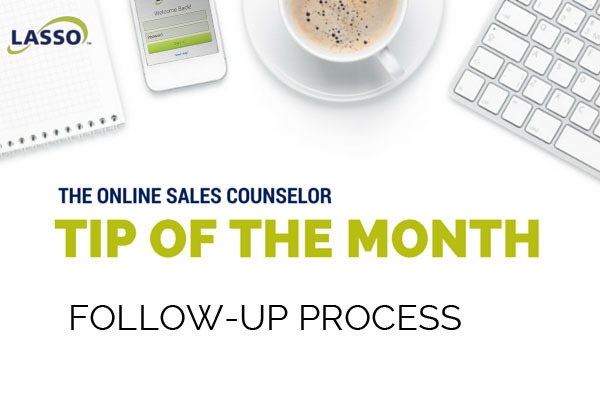 Starting on day 61, the lead should be placed on a monthly marketing campaign or drip campaign so the Online Sales Counselor can stay in front of them until they engage. If a lead starts to engage but becomes unresponsive, follow up every 8-9 days from your last contact. If they don’t respond, schedule an activity every 30 days to send a personal email. You can also put them on the monthly drip/marketing newsletter campaign. This way, you’re actually touching them twice a month – with one marketing message and one personal message.